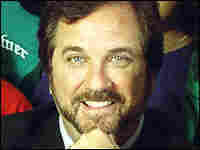 Rafe Esquith Offers His Fiery Teaching Methods Rafe Esquith has taught kids from some of the toughest neighborhoods in Los Angeles. 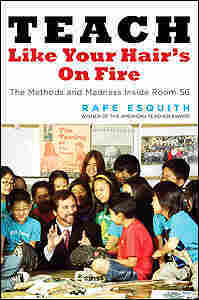 His book, 'Teach Like Your Hair's On Fire,' outlines the methods he's found to be successful. Read an excerpt from Teach Like Your Hair's on Fire. Rafe Esquith is a trail-blazing, fast-talking, fifth-grade teacher who has racked up a slew of awards for his work at a public school in Los Angeles. Ninety-two percent of the children at the school live in households below the poverty level, but Esquith's students have reached the pinnacle of academic and artistic success. His fifth-graders are already tackling high-school fare: algebra, philosophy and Shakespeare. Esquith's methods have been so successful that he has been encouraged to leave the classroom to help other instructors. But he has no interest in abandoning his kids. 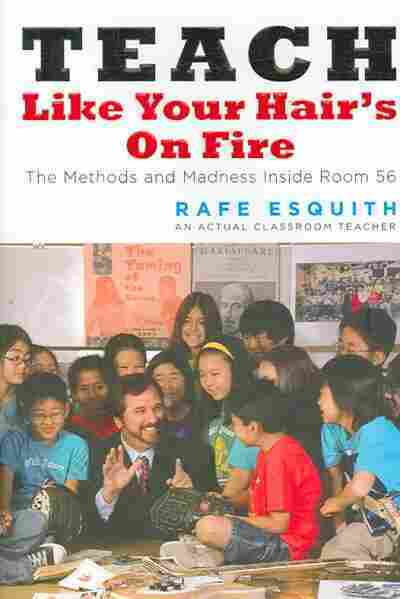 Instead, he wrote Teach Like Your Hair's on Fire: The Methods and Madness Inside Room 56, which Esquith likens to a cookbook for teaching in an urban classroom. The title of the book comes from an incident that occurred while he was helping a student in class with a chemistry experiment. He says his teaching tactics, however incendiary, apply to both teachers and parents. It is a strange feeling to write this book. I am painfully aware that I am not superhuman. I do the same job as thousands of other dedicated teachers who try to make a difference. Like all real teachers, I fail constantly. I don't get enough sleep. I lie awake in the early-morning hours, agonizing over a kid I was unable to reach. Being a teacher can be painful. For almost a quarter of a century, I have spent the majority of my time in a tiny, leaky classroom in central Los Angeles. Because of a little talent and a lot of luck, I have been fortunate to receive some recognition for my work. Not a day goes by when I do not feel overwhelmed by the attention. I doubt that any book can truly capture the Hobart Shake-speareans. However, it is certainly possible to share some of the things I've learned over the years that have helped me grow as a teacher, parent, and person. For almost twelve hours a day, six days a week, forty-eight weeks a year, my fifth-graders and I are crowded into our woefully insufficient space, immersed in a world of Shakespeare, algebra, and rock 'n' roll. For the rest of the year, the kids and I are on the road. While my wife believes me to be eccentric, good friends of mine have not been so gentle, going as far as to label me quixotic at best and certifiable at worst. I don't claim to have all the answers; at times it doesn't feel as if I'm reaching as many students as I succeed with. I'm here only to share some of the ideas I have found useful. Some of them are just plain common sense, and others touch on insanity. But there is a method to this madness. It is my hope that some parents and teachers out there will agree with me that our culture is a disaster. In a world that considers athletes and pop stars more important than research scientists and firefighters, it has become practically impossible to develop kind and brilliant individuals. And yet we've created a different world in Room 56. It's a world where character matters, hard work is respected, humility is valued, and support for one another is unconditional. Perhaps when parents and teachers see this, and realize that my students and I are nothing special, they will get a few ideas and take heart. I am sad when I see so many good teachers and parents surrender to forces that sap their potential excellence. The demons are everywhere. Those who care deeply often feel outgunned by apathetic or incompetent administrators and politicians. Expectations for children are often ridiculously low. Racism, poverty, and ignorance often reign supreme on campus. Add to this mix ungrateful students, and even mean-spirited people in the teaching profession itself, and the hardiest of souls can be crushed. Each defeat usually means that a child's true potential will not be developed. I was fortunate to have a ridiculous moment in the classroom that literally lit my way out of the darkness. Years ago, feeling tired and frustrated, I spent a few weeks searching my soul and did something I rarely do—I questioned whether teaching was worth it anymore. A combination of the aforementioned demons had beaten me down, and I was practically down for the count. But for some reason, when I was guilty of feeling sorry for myself, I spent a day paying extra attention to a kid in class whom I liked very much. She was one of those kids who always seem to be the last one picked for the team, a quiet girl who appeared to have accepted the idea that she could never be special. I was determined to convince her that she was wrong. I was teaching a chemistry lesson, and the students were excited about working with alcohol lamps. But the girl couldn't get her wick to burn. The rest of the class wanted to move on with their projects, but I told everyone to wait. I was not going to leave her behind, even after she told me to continue with the others and not worry about her. Normally I do not interfere with science projects, because failure can be part of the learning process. Yet this was simply a matter of faulty equipment; it had nothing to do with the chemical principle we were exploring that morning. I needed to step in. The girl had tears in her eyes, and I felt ashamed of myself for ever having felt like giving up. Suddenly her sadness was all that mattered. Athletes often refer to getting "into the zone" when they forget about the crowd and the pressure and see only the ball. It can happen in other fields too. For that one moment, the only thing that mattered to me was that this girl should have a successful experiment. She was going to go home that day with a smile on her face. I bent closely over the wick of her alcohol lamp. For some reason the wick was not as long as it should have been—I could barely see it. I leaned as close as I could, and with a long kitchen match tried to reach it. I was so close to the match that I could feel the flame as I tried to ignite the lamp. I was determined to get the lamp working. And it started working! The wick caught fire, and I looked up triumphantly to see the smile I expected on the girl's face. Instead, she took one look at me and began screaming in fear. Other kids started yelling as well. I did not understand why they were all pointing at me, until I realized that while I was lighting the lamp, the flame had touched my hair; it was now smoldering and scaring the hell out of the children. Several of them ran to me and swiped at my head. Talk about a dream come true—they got to hit their teacher on the head and say they were trying to help him. A few minutes later, all was well and the experiment pro-ceeded. I felt (and looked) like an idiot. And yet for the first time in weeks, I felt great about being a teacher. I had been able to ignore the crap that all teachers on the front lines face. I had done everything I could to help someone. I didn't do it particularly well, but the effort was there. I thought to myself that if I could care so much about teaching that I didn't even realize my hair was burning, I was moving in the right direction. From that moment, I resolved to always teach like my hair was on fire. There are so many charlatans in the world of education. They teach for a couple of years, come up with a few clever slogans, build their Web sites, and hit the lecture circuit. In this fast-food society, simple solutions to complex problems are embraced far too often. We can do better. I hope that people who read this book realize that true excellence takes sacrifice, mistakes, and enormous amounts of effort. After all, there are no shortcuts.